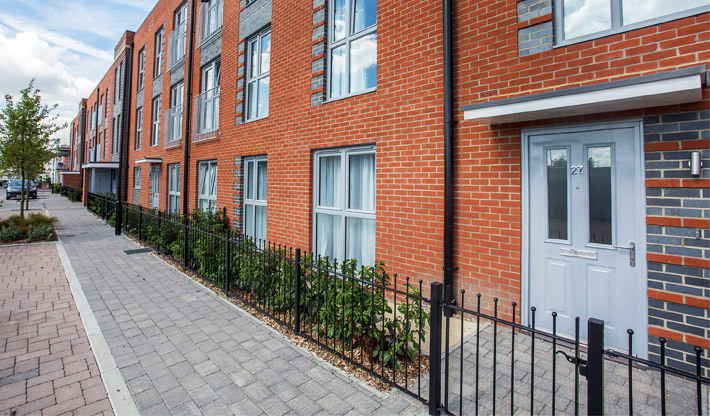 Phase 1 of this major regeneration for the Southampton area involved the design and build of 54 homes along the River Itchen. With post-planning design by Churchill Hui, it won the Regeneration Project of the Year at the South Coast Property Awards 2017. The site was formerly the base for Meridian TV studios but they had been left vacant, leaving the surrounding residential area somewhat neglected. The prime riverside location close to the airport, universities, shops, seafront and cultural attractions made it favourable for regeneration by Inland Homes. Churchill Hui inherited this project of 54 houses and flats with planning permission already secured. Our Architects amended the plans to resolve some outstanding issues. Firstly, the brick and render finish on the original plans would not be suitable for a coastal location as would discolour over time. Our solution to this was to alter the plans to two-tone brick only. The brickwork design mimicked existing building style in the area. Secondly, a major fibre optic cable was discovered under part of the proposed scheme. Serving the airport, it was not possible to disrupt or build over it, and the scheme services were too big to relocate. We redesigned the affected corner of the scheme to avoid the cable’s path and the plans were resubmitted successfully. The biggest challenge was to reorganise the layouts of all the units to make the scheme not only more functional but far more economic to build while protecting and enhancing the original approved planning features. Together with the client, we value engineered the design to this end, without altering quality or appearance. Several planning conditions relating to energy performance were discharged by Churchill Hui. Specifying the latest methods of insulation for traditional construction and an array of PV panels on the flat roofs made it possible for the scheme to exceed the design requirements for energy performance. The finished housing scheme forms an attractive horse shoe of flats, not exceeding three storeys high, with four terraced houses closing the loop. The units are accessed via an internal road off the main road with parking, a river walkway, landscaping and courtyard/private gardens. This is only Phase 1 of the waterside development, but it has already won Regeneration Project of the Year. The scheme was recognised at the South Coast Property Awards 2017 for its “innovation, strong architectural design and approach to environmental issues… which will dramatically enhance the River Itchen waterfront”. We are thrilled to have worked with Inland Homes on such a well-received development that will provide stunning houses and flats in a previously neglected area.